This post is a little late in coming, but I figure that pumpkin-anything is good for far longer than just Thanksgiving. I see no reason why the good old pumpkin pie should be relegated to just that one holiday. And speaking of which, what’s the best part of a pumpkin pie? The filling of course – so skip the crust and just go for the best part with my crustless pumpkin pie recipe. Let’s live a little!You may be wondering why I eliminated the crust for this pumpkin pie. Yes, the crust’s the least exciting part of pie, but it’s still a good transport vehicle for the pie filling. Well, here’s why: my mom has a gluten sensitivity. It started a few years ago and she’s gotten progressively more sensitive to smaller amounts of gluten in her food. So she does her best to avoid gluten while still eating foods she enjoys – it just takes some tweaks to recipes to make them gluten-free (and luckily there are lots of gluten-free recipes out nowadays – it’s chic to be gluten-free). Turns out all the gluten in pumpkin pie is found in the crust, so simply removing the crust solves the problem, and pumpkin pie filling is solid enough on its own that it really doesn’t need the crust to be a successful pie. I was a little wary at first, but after baking a very successful crustless pumpkin pie for Thanksgiving, I know firsthand this pie can definitely hack it. Flavorful, moist, and best of all gluten-free (plus cutting out the crust eliminates lots of fat and calories), this crustless pumpkin pie is a winner any time of year. Preheat oven to 325 degrees Fahrenheit, and spray a 9-inch glass pie dish with nonstick spray. Set aside for now. Mix together the pumpkin, evaporated milk, sugar, eggs, spice, cinnamon and salt in a large mixing bowl until smooth and combined. Pour the filling into the sprayed baking dish (any extra can be poured in a second ramekin). Carefully place the full pie dish in the oven and bake for 45 to 50 minutes, then remove and let cool before serving with whipped cream. 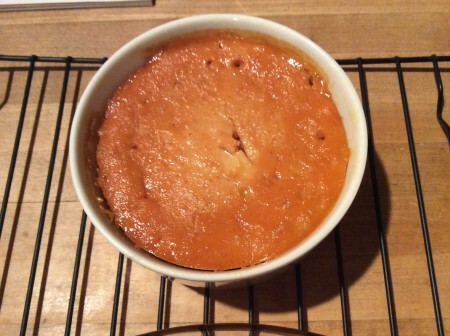 My crustless pumpkin pie filling was too much for the pie dish, so the extra was baked in a little ramekin. Even though it’s in a little ramekin, the crustless pumpkin pie mini tastes just as good. 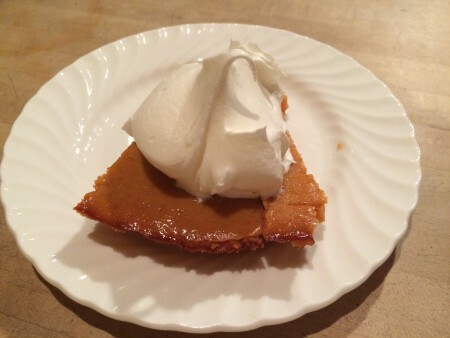 A perfect slice of crustless pumpkin pie with a big dollop of whipped topping. 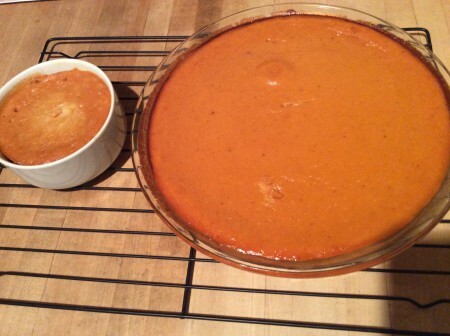 This entry was posted in Desserts, Recipes and tagged Crustless Pie, Crustless Pumpkin Pie, Desserts, Gluten Free, Gluten Free Pie, Gluten Free Pumpkin Pie, Pie, Pumpkin, Pumpkin Pie, Recipes on December 14, 2014 by Paige N..